United Cutlery’s Combat Commander line expertly and successfully takes tried and true historical weapon designs and updates them for modern warfare. Each of our products has been inspired by a beast of a weapon out of history and the trench knife, originally used and designed by soldiers during WWI, was a perfect candidate for modern innovation. The new Combat Commander Sentry Trench Knife is a sleek and modern, battle-ready version of the iconic trench knife and we believe you will absolutely be combat ready with this incredible blade. With the success of its modern, tactical updates on several other historical weapons, United Cutlery continues to explore the possibilities of making time-honored weapons relevant in today’s world. “Each of our products has been inspired by a beast of a weapon out of history and the trench knife, originally used and designed by soldiers during WWI, was a perfect candidate for modern innovation,” said Clint Kadel, CEO of United Cutlery. Since fighting was taking place primarily in the trenches during the First World War, trench knives, also called knuckle knives, were created to use in those close quarters combat situations. They became important weapons in a style of warfare that depended on overtaking an enemy’s trench line and both the Allied and Axis forces employed them. The early versions of this specialty knife were constructed by the soldiers themselves or ordinance blacksmiths and were usually just shortened military-issue bayonets. The official United States Mark I Trench Knife, issued in WWII, featured a cast bronze “knuckle duster” guard, which wasn’t intended to be used as a weapon per se but to protect the fingers. However, the pommel, on the other hand, was designed to specifically bash in an enemy’s head. “The new Combat Commander Sentry Trench Knife is a sleek and modern, battle-ready version of the iconic trench knife and we believe you will absolutely be combat ready with this incredible blade,” said Kadel. 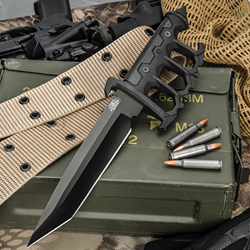 The new trench knife from United Cutlery’s Combat Commander line brings the same game-changing innovation that those early soldiers had with its updated razor-sharp, 1065 high carbon steel blade, finished with a black non-reflective coating for those undercover missions. There is no denying that this is a real muscle-blade with its powerful, thick design. The traditional knuckle duster handle has also been given a tactical construction upgrade to black, heavily textured powder-coated cast metal and it features no-slip rubberized grip inserts and the requisite skull-crusher pommel. “We are committed to making our Combat Commander line your go-to for tactical weapons, made from the highest quality materials, that you can always count on to back you up,” said Kadel. For more information or to purchase the new Combat Commander Trench Knife, visit http://www.budk.com/Combat-Commander-Sentry-Knuckle-Knife-38015?sourcecode=TRENCH18.